In December 1884, Tom Potter the secretary of Royal Liverpool Golf Club suggested the idea of holding a championship open to amateur players. 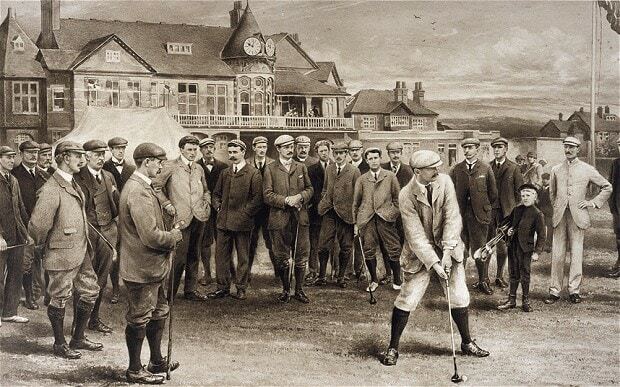 All the leading clubs were invited to send entrants, and a total of 44 players from 12 clubs took part in the tournament held at Hoylake in 1885. The format was matchplay and the rules stated that if a match was drawn then both players advance to the next round. This unbalanced the draw with three going through to the semi-finals and the winner Allan F. Macfie had a bye to the final. Despite the rules, the tournament was so successful B. Hall-Blyth, Captain of Royal Liverpool wrote to the Royal and Ancient Golf Club urging them to inaugurate an official tournament. The proposal was met favourably and clubs in England and Scotland were invited to send delegates with a view to drafting the necessary regulations, a cup was purchased and duly presented the following year at the Amateur Championship at St Andrews. Benjamin Hall Blyth resided in Kaimend overlooking the West Links at North Berwick and was a former Captain of Tantallon Golf Club in 1896-98. Effigy of Tom Morris on top of the trophy reflecting the importance of the Amateur game at that time. There was an earlier tournament in 1858 at St Andrews which attracted an entry of twenty-eight followed much the same lines as the present Amateur Championship. The winner was Robert Chambers, the famous Edinburgh publisher. He was twenty and the youngest player in the tournament, for which he had entered from Bruntsfield Club. Chambers was also Captain of Royal Liverpool and Tantallon (1880-88). In 1885 he moved from Edinburgh to North Berwick and built the imposing St Baldred's Tower as his residence. The Championship was played on six courses, Prestwick, Westward Ho!, St Andrews, Sandwich, Muirfield and Hoylake. (All seaside greens). Gullane and North Berwick missed out. In 1919 the Royal & Ancient Golf Club was approached to officially organise the Amateur and Open Championships. The Club agreed and in February 1920 a Championship Committee was formed which included John E Laidlay Robert Maxwell and B. Hall-Blyth representing Tantallon Golf Club. The Clubs which made a contribution to the purchase of the trophy were as follows. Allan Fullerton Macfie, born January 1854 in Liverpool son of John Macfie a sugar refiner and his wife Liias Macfie. Allan who was stone-deaf since birth, moved with his parents to 14 Hope Terrace, Whitehouse Gardens, Edinburgh where he learned to play golf. In 1877, Allan sailed to Australia on the City of Adelade and arrived in Melbourne on 29 March. On his return to Scotland he settled in St Andrews. Macfie was a familiar figure in North Berwick having played the West Links on several occasions. He was in the team representing Royal Liverpool against North Berwick in 1881. Allan Macfie died in St Andrews on 15 January 1943. 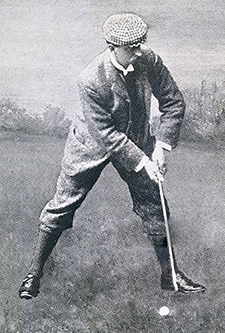 Freddie Tait was a member of many golf clubs and represented his regiment the Black Watch when he won the Amateur Championship in 1896 and 1898. He joined Tantallon Golf Club in 1899 and that year he was defeated at the thirty-seventh hole in the Amateur Championship at Prestwick by John Ball Jnr. This was the fifth time Ball had won the championship. Only four players Hutchinson, Laidlay, Maxwell and Tait have scored double wins up to 1909. John R. Gaidner played in the Amateur Championship in 1896 (Sandwich), 1899 (Prestwick) and represented Mid-Surrey Golf Club in the championship in 1900 (Sandwich), 1901 (St Andrews) and 1902 (Hoylake). He entered from Tantallon Golf Club in 1903, and 1909 at Muirfield and 1905 at Prestwick. Gairdner played for the Scottish team against England at Holylake in 1902 watched by over a thousand spectators. At Prestwick in 1905, Gairdner and Robert Maxwell met in the 5th round. Maxwell won the dual of the Tantallon members but was defeated in the next round by A. Gordon Barry who went on to win the Championship. Gairdner was elected Captain of Tantallon Golf Club in 1908-10 and on his death in 1919 his family presented all his medals to the Tantallon Club. Alex Mackenzie Ross learned to play golf on Bruntsfield and Musselburgh links. He won the Hope Challenge Medal at Kilspindie in 1893 and 1900 and was the first winner of the Braid Hills Tournament in 1889. Alex played in the Amateur and Open Championship and was elected Captain of Tantallon Golf Club (1900-02). Johnny Laidlay winner of the Amateur Championship in 1889 and 1891, was a pioneer of the overlapping grip, twice Amateur Champion, runner-up three times and leading amateur in the Open four times. He played for Scotland against England every year from 1902 until 1911 when he was fifty-one. Laidlay was elected Captain of Tantallon Golf Club (1906-08). It was in 1902 when the Royal Liverpool arrange the first amateur international match between England and Scotland. John Ball and Robert Maxwell led out their respective teams. Thomas Mansfield Hunter (b.1877) and his brother Norman Frederick Hunter (b.1879) sons of Dr. James Adam Hunter MD and his wife Marion Mansfield. 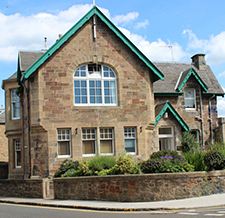 They resided at 18 Abercromby Place, Edinburgh where their father had his medical practice. Thomas Mansfield Hunter was educated at Edinburgh Academy, and attended Cambridge University. Mansfield played in the first Amateur Championship in 1885 and again in 1888. He was a member of Tantallon Golf Club and the Honourable Company of Edinburgh Golfers. In July 1899 Mansfield Hunter and his partner Charles Dalziel played a 36-hole match against Freddie Tait and Robert Maxwell at Muirfield. Hunter and Dalziel won the match 2 & 1, but lost the return two days later. In 1901 he won the Tantallon Club Medal, and also the Victoria Jubilee Cup. He won the scratch medal at the spring meeting from a field which included J.E Laidlay, L. Balfour-Melville and R. Maxwell. Mansfield was elected captain of Tantallon Golf Club (1910-12), and during this period Tantallon played an annual match against The Oxford and Cambridge Golfing Society. Mansfield Hunter qualified as a Barrister-at-Law and in 1910 he resided in Carters Hotel, 14 Albemarle Street, Mayfair, London. Norman Frederick Hunter was educated at Loretto School in Musselburgh before going up to Christ’s College in Oxford University. He learned to play golf on Musselburgh links and was a member of the blue blood fraternity of amateur golfers at Tantalllon Golf Club, North Berwick. He was captain of The Oxford and Cambridge Golfing Society when they toured America in 1903 and 1912. The Chicago golfers can still remember when the trim clean-cut Norman F. Hunter made his 71 on the Wheaton course. 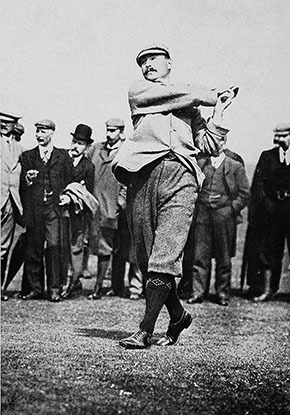 Norman and his brother Mansfield entered the Open Championship in1904-1906. In 1911 Norman and his wife Elizabeth were living on private means in Huntingdon, Ascot and was captain of Sunningdale Golf Club. Norman was an underwriter with Lloyds Exchange, London before he enlisted as a commissioned officer in WW1 and joined the Royal Warwickshire Regiment, and was attached to the Royal Fusillers. Lieutenant Norman Hunter was posted to France when he was reported as missing in action, presumed dead. The last reported sighting of him stated that he was left wounded in the hip in a trench that had to be abandoned to the enemy on June 16th at Hooge,Ypres. His military record states 'THIS DEATH HAS NOT TO BE ADVERTISED'. Robert Maxwell won the Amateur Championship at Muirfield in 1903 and 1909. He presented the Amateur Trophy to Tantallon Golf Club for safe keeping throughout the year. In 1909, Ben Sayers designed a driver called 'Dreadnought' and gave one to Maxwell who used it to great effect in the final against Captain Cecil Hutchison. Following Maxwell's triumph in 1909 every golfer wanted a ‘Dreadnought’ and the Ben Sayers factory could not keep up with demand. Maxwell played every year for Scotland against England from (1902-07 )and then (1909-10). Bob Maxwell was Captain of Tantallon from (1902-04).